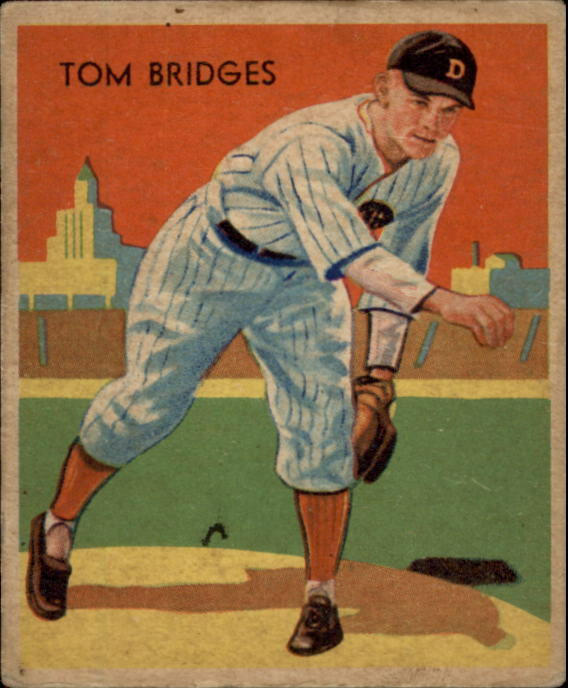 This stylish card of Detroit righty Tom Bridges overlays a realistic, posed follow-through on top of an Art Deco outfield and horizon. It shows off the set's typical intense color (more pictures here), with vibrant red and green fighting for your visual attention. It's believed prewar sets show such colorful skies because the coal soot of urban industry transformed late afternoon sun into red, orange, and purplish clouds. Tiger Stadium (aka Briggs Stadium in those days) might not allow for this exact shot, but the artist appears to have placed actual Detroit skyline highlights behind Tom. Boxes show the relative position of Tommy in black and two prominent "New Center" buildings in grey, as they were in the 1930s. I'm told our leftmost building's the Fisher Building, home to live performance at the Fisher Theater. Its steeple is broadcast tower for WJR. Our rightmost building appears in many skyline photos, but can't find a name so far. Bridges' long, slender fingers enabled him to throw a highly effective curve. Toss in a decent fastball, adequate control, and you get plenty of strikeouts. Tom broke the Tigers team record for Ks in 1941, which stood until Hal Newhouser came along. This #5 Diamond Star Gum card discusses how pitchers grip the ball, appropriate for his talents. "Pitching Tips - How to Grip the Ball. Most major league pitchers grip the ball with the fingers across the seams, to obtain a firm purchase. 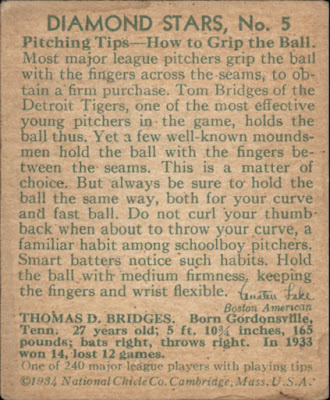 Tom Bridges of the Detroit Tigers, one of the most effective pitchers in the game, holds the ball thus. Yet a few well-known moundsmen hold the ball with the fingers between the seams. This is a matter of choice. But always be sure to hold the ball the same way, both for your curve and fast ball. 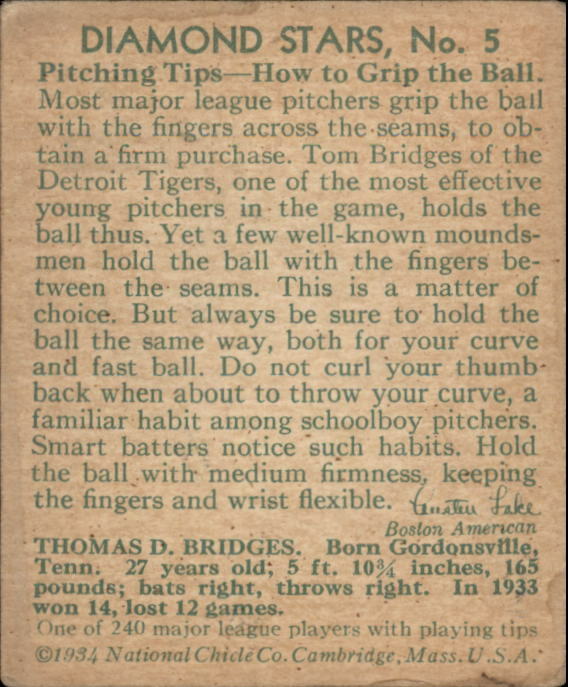 Do not curl your thumb back when about to throw your curve, a familiar habit among schoolboy pitchers. Smart batters notice such habits. 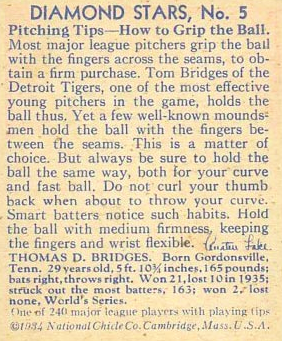 Hold the ball with medium firmness, keeping the fingers and wrist flexible." 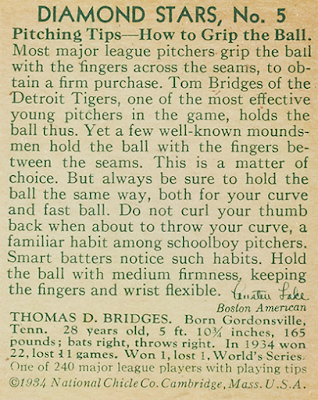 I love this phrase: "Tom Bridges...holds the ball thus." That's old school sportswriting. Boston American columnist Austen Lake supplied the set's text and received a byline on each card. Also note those 1933 stats after his bio, because they're our key clue to tracking yearly variations. 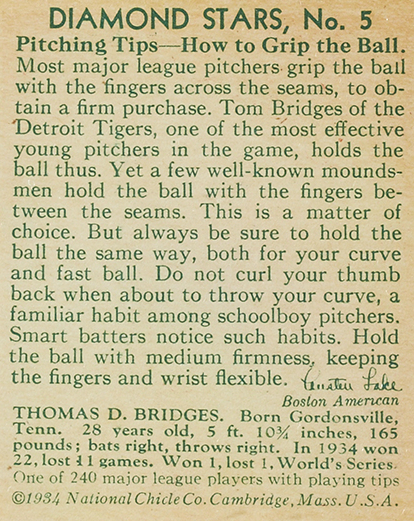 National Chicle printed #5 Tom Bridges all three years of their 1934-36 run, revising his short bio paragraph with the previous year's stats. This 1935 series reflects Tom's 1934 win/loss record and World Series success. The copyright date remained the same across all of Tom's cards, even as the stats changed. 1936's printing switched to blue ink and include Tom's 1935 win/loss record. Detroit reached the World Series again in 1935 and this time Tom won twice. VALUE: I was lucky to receive this card gratis from a collecting friend. Diamond Star Gum "commons" run about $10 on eBay, but players like Bridges, a key part of the first Tigers championship in 1935, could cost more if a team collector's on the hunt. FAKES / REPRINTS: Many reprints and counterfeits exist for the full set and individual stars of this Diamond Stars set, so familiarize yourself with prewar's thicker card stock and other aspects of similar sets to avoid buying a reprint as the real thing. Bright white borders and thin paper are the easiest way to know for sure you have a postwar reprint.